Here is a topic I've been meaning to address for some time. 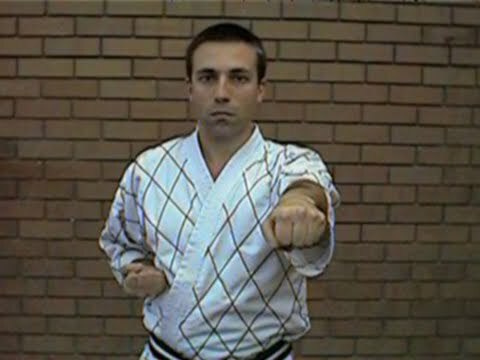 I hear a lot about how karate and other traditional martial arts "have lost the plot" with all "all their chest punches". Most commonly I hear the refrain: "Who does that anyway?" Disregarding the fact that body blows occur, it does seem a bit odd to see so many punches seemingly directed to the chest in forms, traditional two-person sparring etc. I've heard every "theory" under the sun - "They aren't really punches!" (yeah right), "They're hidden/secret techniques!" (not that again) and "There are death points on the chest! (so why aren't people dying around the world?). I believe the answer is rather more simple. It's all about training at the at the correct range - and accordingly making your training more realistic and practical - and doing it with reasonable safety from injury. But what do we end up seeing? Almost all traditional martial artists (and I include myself - for I have been, and probably will continue to be, guilty of this) end up practising out of range. This results in misinterpretations of things like "palm blocks" which almost totally erase what I believe is the knowledge of the ancients. Lucky for us, all it takes is a bit of closer examination to get back to "making it real". And this always makes it clear what works and what doesn't. So the answer to the issue of chest punches isn't to look at them as an attacking technique - but as a base for testing defensive ones. In other words, the bottom line with chest punches is this: you're not training punches: you're training deflections. What about the "bad habit" you might get into of punching people in the chest rather the head? First, I've always found that you punch where you choose to punch. That main thing is that your punch should be capable of landing - not guaranteed to miss. Otherwise, where you choose to land your punch is your prerogative. Second, I think you'll only "default to punching the chest" if the only punching you do is chest punching. I don't know anyone who does this. The nearest one gets is karateka preparing for a kyokushin-type competition where head punches are excluded. Yes, such practice can instil bad habits if it is done too much at the expense of general training. But in the end, the bigger problem for the competition practitioner is not "too much chest punching" - it's forgetting to defend (particularly the head). Fighters become blaze about taking punches to the chest; they forget that punches to head can't be absorbed with such alacrity. Personally, I've personally never experienced any sort of "chest punching" habit - whether "competition-induced" or otherwise. To begin with, we punch to lots of targets: head, solar plexus, kidneys, liver, throat... you name it. Chest punches are really just confined to certain partner exercises and the odd basic kata (fukyugata). In any event, the most common bad habit I see in arts like karate has nothing to do with chest punching. Rather it is the fact that most people in traditional martial arts train well out of range. And that is a far worse habit than the alleged habit some might suggest you'll develop from "punching to the chest" - (particularly if this is principally confined to basics, standing and one step sparring and the odd basic kata move). In our school we use head punches all the time - in sparring and basic drills. We just don't use them when trying to test deflections in a realistic environment. You can't test deflections nearly as well with head punches because protective gear (gloves, headgear etc.) seriously impede your movement, your ability to see and your access to intercepting your opponent's forearm with your forearm - all the things you need to make deflections work. And, protective gear or not, head punches are never really safe - especially in the longer term. Basically martial arts practise should involve punches at all heights - particularly the head (where, as my friend Zach points out, the "light switch" is contained). But to understand deflections (a cornerstone of defence in traditional arts) you need to train at the right range. And chest punches are about the only thing I've ever discovered that will let you do that at full speed and power. Yes, chest punches hurt. But they don't hurt nearly as bad as head punches. And I have experienced a broken sternum, so I have some idea. Just today I injured a joint where the rib inserts into the sternum. But aside from not doing bench for a few days, I'll live. I'd rather not get my teeth smashed or my nose broken when actually testing deflections properly - and learning to actually apply them.